Imagine waking up one day and you find out that you’ve lost hundreds of thousands of dollars. That million dollar portfolio just become $500,000. Just thinking about that gives me the shivers. Luckily, this doesn’t really happen to us overnight- unless maybe you are invested in bitcoin and other crazy crypto-currencies. While this scenario doesn’t happen overnight in the financial markets- stuff like stocks and bonds, it does happen quite often over a number of years. I’ve seen it. This is real! We call it the behavior gap… which is pictured below (a bit different than cognitive dissonance). The idea- which is commissioned and championed by Dalibar*- involves an annual study of the behavior of investors. Dalibar has found time and time again that the ‘average’ investor in given categories has consistently underperformed a given benchmark. 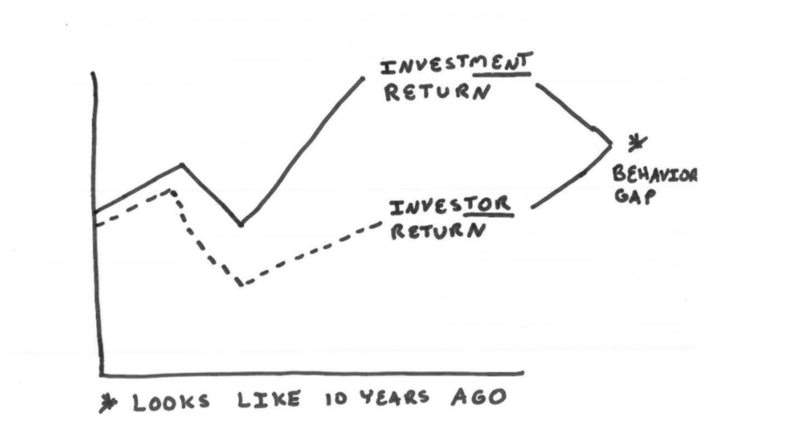 As my “beautiful” drawing above shows- investMENT returns are significantly higher than invesTOR returns. This allegedly happens year after year after year after year according to their study. At first glance, it looks pretty darn bad. This my friends is the behavior gap. Multiple percentage points lost by invesTORS relative to the investMENTS. Now, I haven’t actually seen the study because it costs nearly 4 figures to buy it!!! Talk about a barrier to entry. Are we comparing apples to apples or apples to oranges, bananas, and cucumbers? How do ETFs come into play? Why just look at mutual funds? Is this including institutional money? How are they separating institutional money from retail investors? I know that I’ve used institutional share classes for some clients in the past. Can they really tell the difference? How so? Is The Behavior Gap Real? What Can We Do About It? Regardless, I could tell you story after story where “the behavior gap” is absolutely true. Clients get scared towards the bottom of a crash (or ironically just as much in a rapidly rising market- i.e. 2012, 2013, 2014, 2016, and 2017). They are nervous and worried and frightened. Nothing I can do can convince them that staying in is the right thing to do. Their $1 million becomes $500,000 and they have an extremely difficult time recovering when they are so conservatively allocated- just like some of these people. We can try to NEVER sell in a downturn (think -20% plus) and maintain a given asset allocation. Just look at the statements 1x a year. If it’s down, shrug it off. Alternatively, we could be proactive and yes… try to time the market. However, you have to have a SYSTEM. One that you follow religiously. It can’t be off of feelings or off of your gut. That’s where people mess up. Then, they don’t have a mechanism to determine when they should buy or sell. We want to be greedy when others are fearful, and fearful when others are greedy. That’s why I do believe in using timing strategies. Are they perfect? Absolutely not. However, it does help to allay those fears in a cruddy market. At least we were proactive using the best strategies possible that we’ve found. I think it’s fair to point out that NO investment will consistently out-perform the index it is attempting to beat or mimic. As a matter of fact, they will probably ‘out-lose’ the index. The cost of having an advisor can weigh heavily (or positively) on these results. Some advisors are heavily in variable annuities or loaded mutual funds or mutual funds with high 12-b1 fees. These definitely drag on the results compared to investors with low-cost alternatives. On the other hand, when we use a relatively low AUM or a flat monthly fee, advisors may be able to minimize their costs and thus look much, much better compared to the former scenario. Many investors get it wrong. They sell low and buy high. Have the discipline, determination, and a system to help you overcome the ‘average’ investor bias. Don’t rely on your gut. If this isn’t something you can do on your own, get help! At the end of the day, ask questions. Ask about expenses. Get educated on how fund companies and advisors get paid. Get educated on market cycles and what good markets look like and bad markets look like. And if you dare… discover how to take advantage of good markets and bad markets. 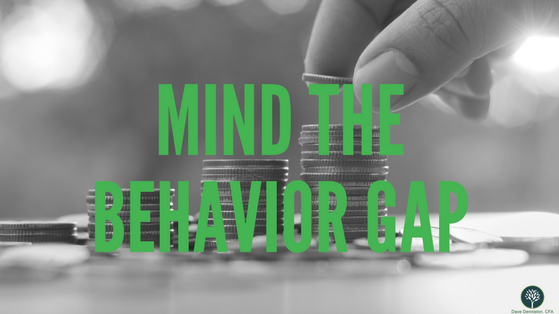 Above all else- remember my friends, mind the behavior gap! Do you have any other questions on this topic? Or maybe you are ready to start planning for the future. 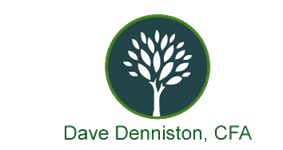 Book your free 30-minute consult with me today. 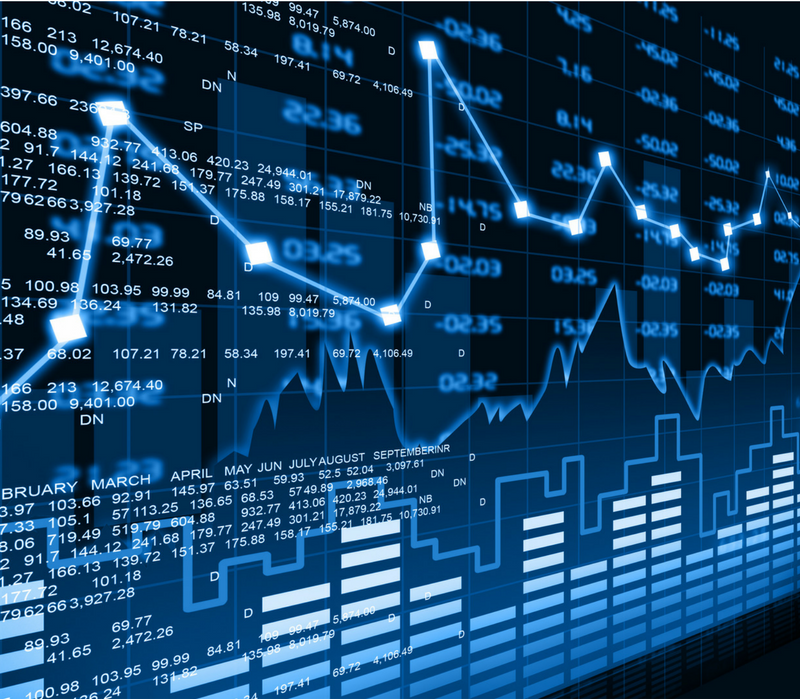 If you’ve enjoyed this guest post, you can learn more about his adventures in illiquid investments & much more nonsense byfinding his latest blog post and videos by clicking here.